William L, is a relatively new brand started by Guillaume Laidet. His watch experience began in Switzerland, but like many watch entrepreneurs he started his own brand. Based in Paris, France, the company manufacturers it’s watches in China, and in this manner is able to build affordable, quality watches based on classic designs. 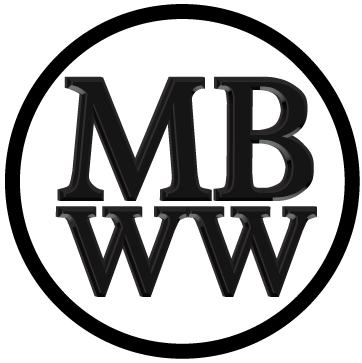 This is a well-grounded way of making a successful Microbrand, that is common throughout the industry. 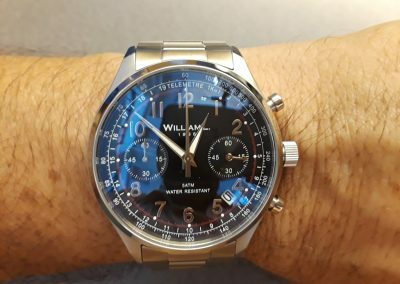 If you build in China or Hong Kong for example, you can build a great watch without the hassle of the high costs associated with the Swiss watch industry. I believe the company name refers to the English version of Guillaume’s name and I suspect 1985 refers to the year he was born. Not all new brands survive their Kickstarter origins, but William L. watches are now available in at least 50 countries and 600 points of sales throughout the world, and of course, through the internet. We have all heard the term “affordable luxury” which in itself is a oxymoron, but the qualities of luxury brands can for the most part be infused into many new watch brands. For a new brand, William L offers more than what you would expect. There are four lines of watches currently being offered; Chronograph, Small Chronograph, Calendar and Diver. 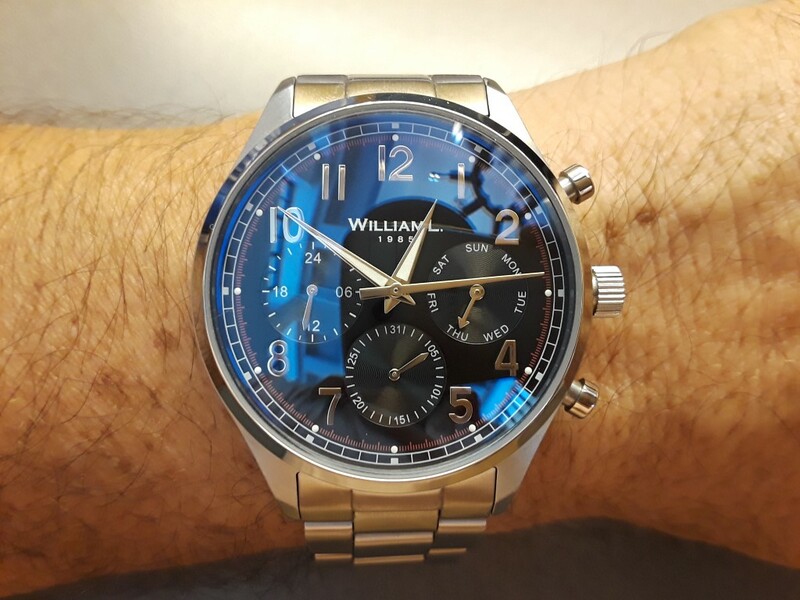 For this review I have one of the Vintage Style Chronographs, model WLACo1NRSB, and one of the Vintage Style Calendars, model WLACo3NRSB. 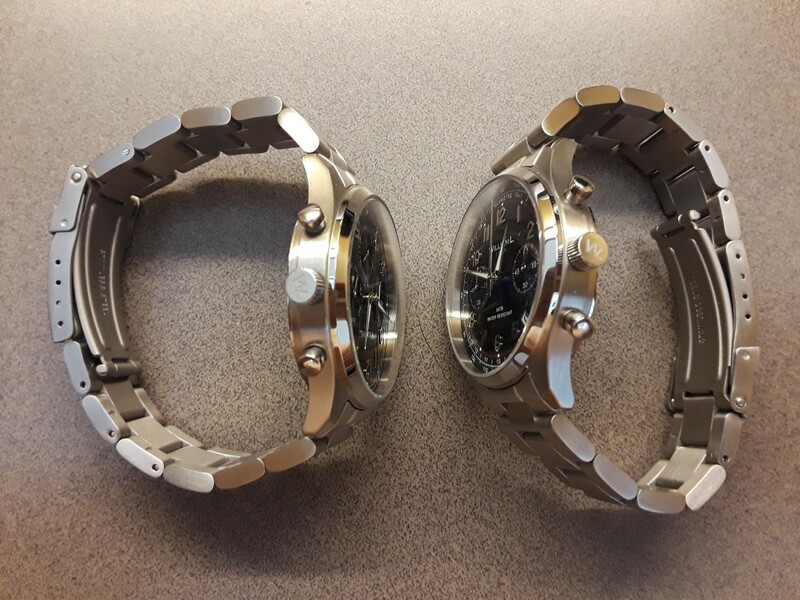 Both watches use exactly the same case, bracelet, pushers and hands. Both watches are 40 mm in diameter and use brushed 316L stainless steel for the case and bracelet. The only external stainless-steel parts that are polished are the bezels, screw down case backs, the pushers and the tips of the lugs. 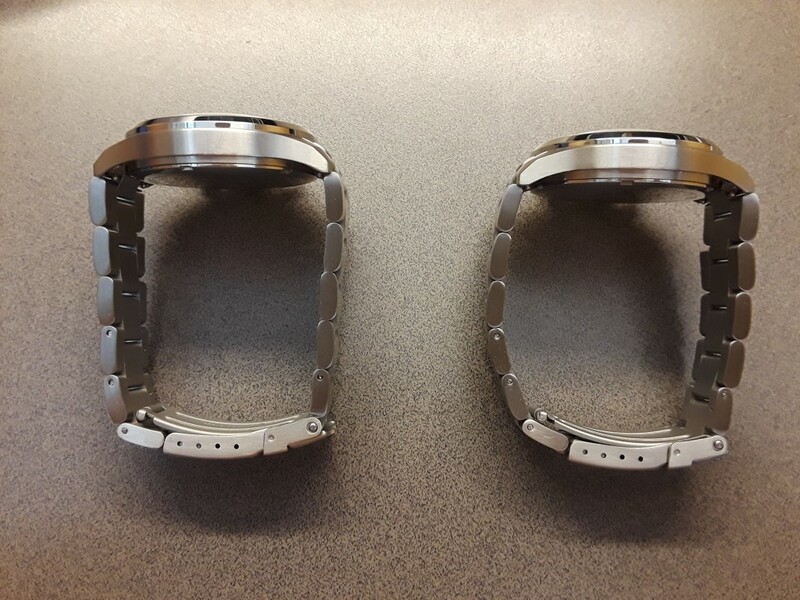 The watches are 20 mm between lugs and use a “Easy Bar” system to make bracelet or strap changes convenient. Both watches use domed mineral crystals with internal a/r coatings and are rated 50 meters w/r. The beveled polished bezels look fantastic on these designs. 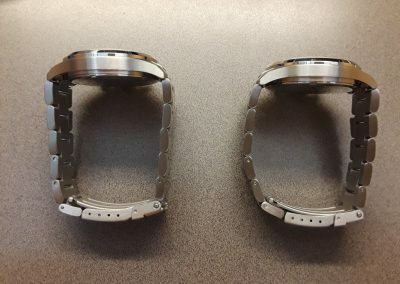 The classic 3 link bracelets used on these watches are solid except for the end links and the fold over clasp assemblies. 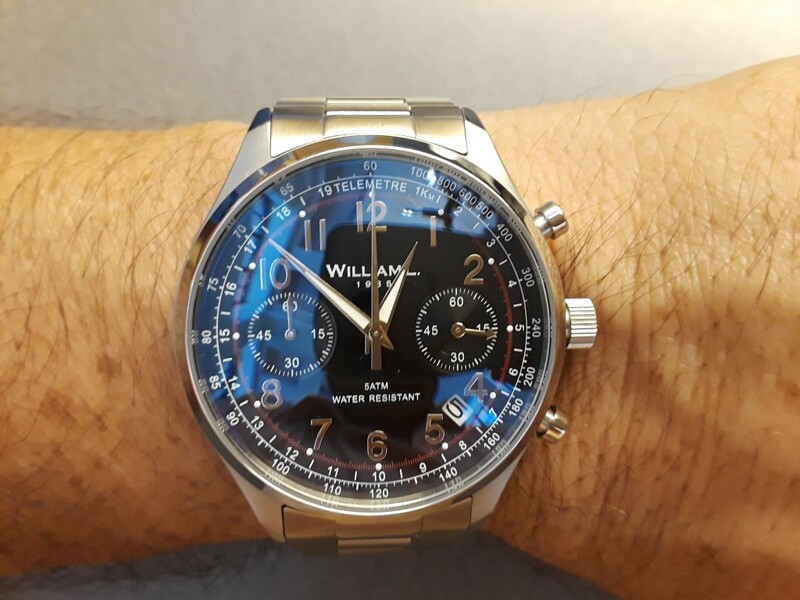 The clasps offer four position micro adjustments and the William L logo is engraved on the clasps as well as on the polished faces of the gear edged crowns. 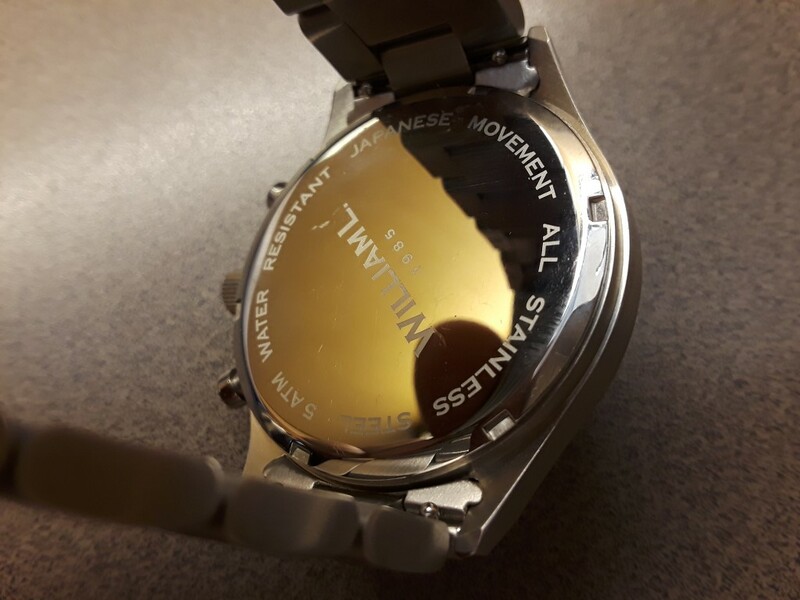 The polished case backs are nicely engraved with the brand name and logo as well as information about water resistance, movement source and stainless-steel construction. The calendar watch used a quartz Seiko VX9J movement while the chronograph uses a quartz Miyota 6S21. Both are affordable and reliable movements that make these watches very easy to deal with. On the chronograph model the upper pusher starts and stops the chronograph while the lower pusher resets it with a smooth and fluid movement of the hands. On the calendar model the upper pusher works the day of the week subdial and the lower pusher works the date subdial. Both watches use raised polished numerals and polished dauphine hour, minute and second hands. Subdials use either polished sword hands or polished arrow shaped hands. The raised polished numerals are slightly larger on the calendar watch and both use guilloche concentric circular designs on their slightly recessed subdials. The calendar model has a 3 o’clock day dial, a 6 o’clock date dial and a 9 o’clock 24-hour dial. The chronograph has a 3 o’clock seconds dial and a 9 o’clock cumulative minutes dial. Markings are white on these black watch faces except for the red seconds dials on both watches. The chronograph has an outer telemeter scale while the calendar model has a railroad track circling the outer edge of the dial. All printing on the watch faces is crisp and accurate. 12 small lume dots are located on the red seconds tracks on both models and the hour and minute hands on both watches are treated with Luminova inserts on their chrome faces. Night time visibility is very sharp but minimal and does not last very long. 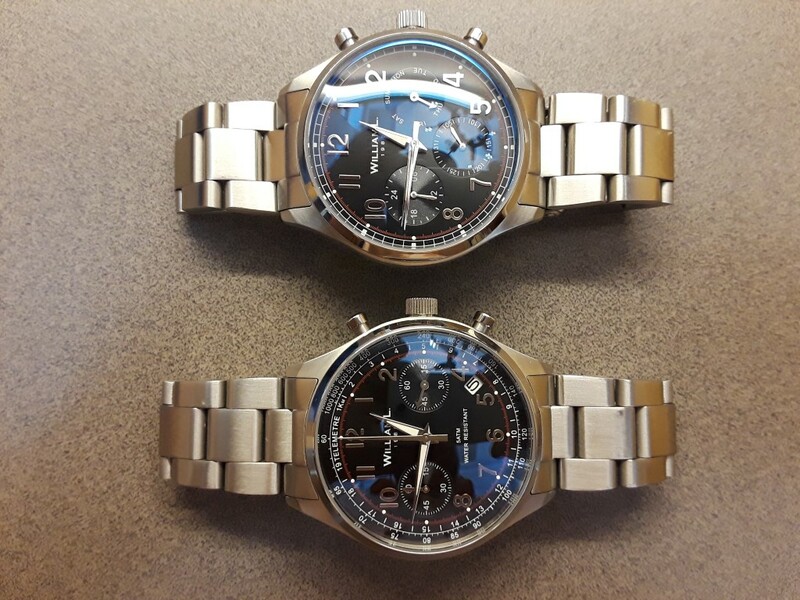 Both watches have brand information on the upper portion of the dial. The chronograph has w/r information on the lower half of the dial plus a black on white 4:30 calendar window that is discrete and easy to read. Finish work on the faces, hands, indices and the watches in general is excellent, particularly considering their very reasonable price points.